National Hunting & Fishing Day is Sept. 22. When you observe National Hunting & Fishing Day Sept. 22 by introducing someone to hunting or fishing, you’ll be following the footsteps of Theodore Roosevelt, the 26th president of the United States. 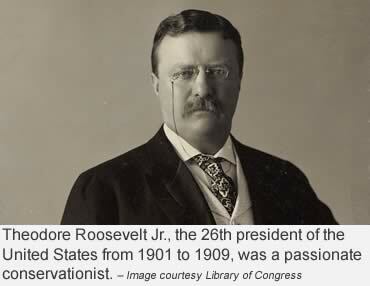 Roosevelt and his fellow sportsmen were the first American conservationists, vocal advocates for laws restricting the commercial slaughter of wildlife. Theirs was a new century in a country that was then 125 years old. They looked around and didn’t like what they saw. They realized rapid development and unregulated use of wildlife had seriously threatened species, and worked to improve the situation. They sought hunting regulations and scientific wildlife management, and established conservation groups. Their goal was the sustainable use of fish and game and they supported the first hunting and fishing licenses. They also lobbied for taxes on sporting equipment to provide funds for state conservation agencies. Roosevelt, who died in 1919, never saw his legacy expand when the Federal Aid in Wildlife Restoration Act became law in 1937. The new law, named for its sponsors, Nevada Senator Key Pittman and Virginia Congressman Absalom Willis Robertson, created an excise tax system to provide funds to each state to manage wildlife and wildlife habitat. Those early actions by conservationists formed the foundation of the North American Model of Wildlife Conservation, a science-based, user-pay system that has seen the most dramatic conservation successes of all time. The first species near extinction to be restored were white-tailed deer, wild turkeys and wood ducks. Conservationists watched the returning health of American’s outdoors by working countless hours to improve millions of acres of habitat. By the way, in 2018 the Interior Department distributed more than $1.1 billion in annual funding to state wildlife agencies from revenues generated by the Pittman-Robertson Act and the 1950 Dingell-Johnson Sport Fish Restoration Act. However, during the 1960s, hunters and anglers embraced the era's heightened environmental awareness, but wildlife agencies, hunters and fishermen became discouraged that many did not understand the crucial role sportsmen played—and continue to play—in the conservation movement. The first person who suggested an official day of thanks to sportsmen was Ira Joffe, owner of Joffe's Gun Shop in Upper Darby, Pa. In 1970, Gov. Raymond Shafer adopted Joffe's idea and created Outdoor Sportsman's Day in Pennsylvania. With prompting from the National Shooting Sports Foundation, the concept soon emerged in Congress. In June 1971, Sen. Thomas McIntyre, N.H., introduced Joint Resolution 117 authorizing National Hunting and Fishing Day on the fourth Saturday of every September. Rep. Bob Sikes, Fla., introduced an identical bill in the House. Both passed unanimously. President Richard Nixon proclaimed May 2, 1972 as the first National Hunting and Fishing Day. By late summer, all 50 governors and more than 600 mayors proclaimed state and local observations of National Hunting and Fishing Day. National, regional, state and local organizations staged 3,000 hunting- and fishing-related events everywhere from shooting ranges to suburban frog ponds, providing an estimated four million Americans a chance to experience, understand and appreciate traditional outdoor sports. Over the years, National Hunting and Fishing Day has been assisted by celebrities who have volunteered to help spotlight the conservation accomplishments of sportsmen and women. Honorary chairs have included George Bush, Tom Seaver, Hank Williams Jr., Arnold Palmer, Terry Bradshaw, George Brett, Robert Urich, Ward Burton, Louise Mandrell, Travis Tritt, Tracy Byrd, Jeff Foxworthy and 2018 chairman, NASCAR racing legend Dale Earnhardt Jr.
To learn more about NHF Day, visit http://www.nhfday.org/. Resources--National Hunting & Fishing Day, USFWS, U.S. Department of the Interior. Each year sportsmen and women fund more projects that enable more public access areas to be open. Hunters and anglers pay for most fish and wildlife conservation programs, through license sales and excise taxes paid by the hunting, shooting, boating and angling industries on firearms, bows and ammunition and sport fishing tackle, some boat engines, and small engine fuel. On average, hunters spend $1,638 every year on the sport, with taxes on equipment allocated to support conservation. To date, the U.S. Fish and Wildlife Service has distributed more than $20.2 billion to state conservation and recreation projects. State-by-state listings of the final Fiscal Year 2018 apportionments of Wildlife Restoration Program fund can be found here. And, you can click here for the Sport Fish Restoration Program fund allocations by state.